Esophagectomy has been widely used to treat several esophageal diseases including cancer. 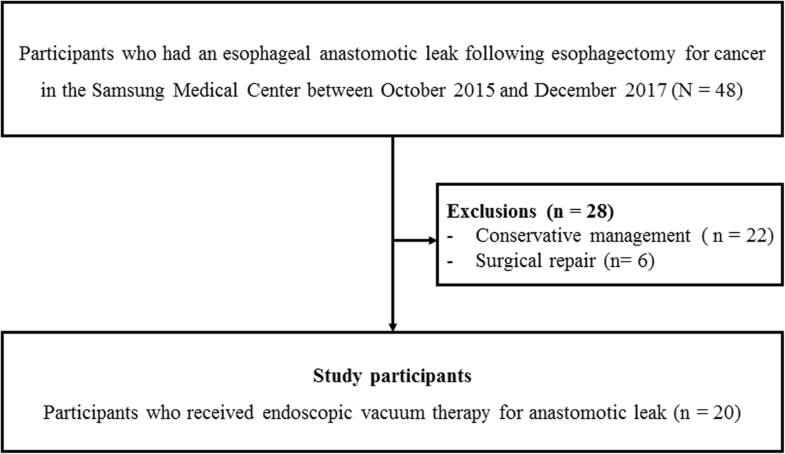 Several anastomotic complications can occur following esophagectomy. Anastomotic leak is the most common and serious complication. The leakage rates vary from 3 to 25% [1–5]. The optimal treatment for anastomotic leak remains unclear. Conservative management with nil per oral, intravenous antibiotics, and drainage and surgical and non-surgical therapies could be applied according to patient status and institutional preference [6–8]. Surgical intervention may be the treatment of choice for leaks with sepsis. In a study by Crestanello et al., the survival rate was similar between the reoperative and nonoperative groups despite the fact that the former had more severe patients . If the leak is minimal and the patient is stable, conservative management can be performed to avoid a repeat surgery. When between these extremes, endoscopic treatment could be applied. Among the endoscopic treatments, the insertion of a fully covered self-expanding metal stent (SEMS) has been most extensively studied and has proven to be effective [1, 10, 11].